A great cookie. I've been eyeing this for awhile and finally made it and it was easy and turned out a light crunchy cookie with a great flavor. I added the almond to the white dough, added 1/2 tsp strawberry extract with the red food coloring to the other dough and for the third mixed in the 1 oz melted chocolate as stated, but also added three tablespoons Hershey's cocoa powder when it wasn't as dark looking as I wanted. I only chilled for two hours and it was easy to cut. The only thing I would do different is take the suggestion of another reviewer and cut the dough lengthwise into three sections instead of two as the cookies would be good a bit smaller. 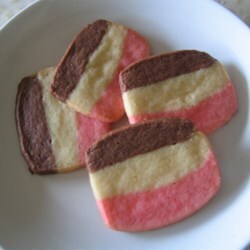 A fun cookie that the kids love..a keeper.